(April 11, 2019) 7:15 AM I’m no expert on world missions, but by God’s providence I’ve been around the globe a few times. It has been an enormous privilege to minister in many countries. It humbles me to think that I’ve had a front row seat to see the workings of God in many parts of the world. It began in 1978, when Becky and I spent 3 months in West Germany. Some aspects of that trip were ludicrous: I thought I could speak German, but frequently made a fool of myself. I was often corrected ruthlessly. Still, I was privileged to see the Lord’s hand in the work our brass octet did as we traveled the length of breadth of that nation. Even in those early days, I realized that God can take any talent we have and use it for His service. The very evening we arrived in Seeheim after 24 hours of travel, I was asked to usher for a crusade being given in town by Joni Earickson. All I wanted to do was sleep. But I was young, and besides, who could pass up an opportunity to hear Joni speak? Her talk was electric. Such were some of the excitements of ministry in the early days of my life as a missionary of Christ. Later I began traveling to South Korea to teach. I’ve made 6 such trips. This was my first real exposure to Asian Christianity, and I was fascinated to see the appeal of Jesus to the students I taught. At first I thought I was an abject failure. The students would never look at me when when I lectured. Later I was told that this was a mark of respect in that culture. You learn something new every day. My trips to Korea reinforced my determination to make Christ known wherever in the world I went and as long as I could travel internationally. I have the happiest of memories of my 17 trips to Ethiopia. Simple to see where Becky grew up made an enormous impression on me. Today, during my lectureship at Piedmont International University, I plan on sharing some stories of our visits to Africa. Our repeated visits to Ethiopia were not without costs: malaria for me, and unspeakable disappoints for Becky. I began turning my attention more to Europe, especially the countries that were once in the Soviet Union. I can’t always recall why I was initially invited to visit Romania or Ukraine, but I was, and I delighted in the fellowship I enjoyed with my brothers and sisters there. I remember well a lectureship I gave for a week in Romania. It began in Oradea and finished up in Bucharest. Midweek I happened to be in Cluj, which my mother’s family of 12 left in 1916 in order to make its way to the U.S. It was a bit embarrassing for me not to be able to speak a word of the language, even though I am half Romanian. But it was wonderful to see the dedication and commitment of young people with had practically nothing, except a deep love for Jesus. When later I returned to Asia (13 further trips), what struck me was the way the new generation of Christians were taking risks for God and seeing fruit. I felt a sense of shame that we in the West are sometimes ignorant of the persecution of our brothers and sisters in other parts of the world, and I found myself praying that God would fan into flame the small fires of renewal to be found in churches where I live and work in North Carolina and Virginia. I can’t help but wonder how different how things might have been for me had Becky and I not taken that first trip to West Germany. It’s remarkable to see what the Lord is doing all over the world. And it is remarkable to see more and more North Americans becoming intentional about missions both at home and abroad. This speaks eloquently of the free grace of Christ that lies at the heart of the Gospel. Ask God to show you the needs of the people you hope to reach. Be practical and sacrificial in responding to them. There is nothing iconoclastic about the Great Commission. Partnership is the key word. We have a long way to go in our churches in America, but the job can be done provided we are prepared to make sacrifices of our time, prayer, finances, and commitment. 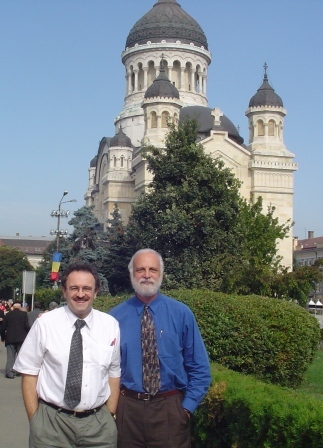 Radu Gheorghita, a Romanian-American who teaches New Testament at Midwestern Seminary, served as my translator during my lectureship in Romania. Here I’m trying to give my best impression of Count Dracula since we’re standing in front of his castle in Transylvania.